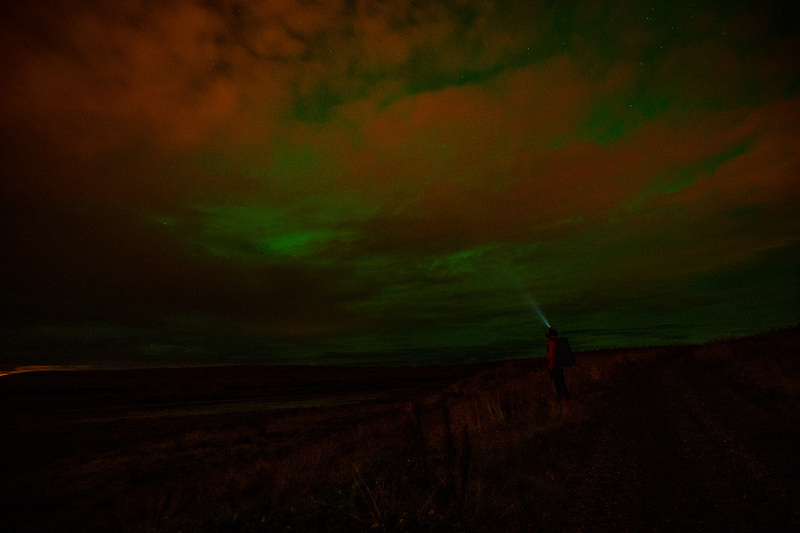 Wearing the Borealis under its namesake aurora in Iceland. With more days on the road than at home, I’m often asked where I live – I’ve found myself responding “JFK airport” more and more. Likely more than a decade has passed since I’ve spent two weeks in the same bed consecutively, and chances are that was for a big road gig in Vegas or something. Give me a week straight at home and I’ll call it a vacation. I’ll admit travel is better than cube life, but it ain’t as easy at it once was. Like ambulance rides, airports tend to be one of those things to bring out the absolute worst in people; just stand near a helpdesk when a flight is cancelled, or see the recent kicking and screaming trend of being dragged off 737s. Modern travel takes a new resilience, from battling TSA crowds to the WWF match for overhead bin space. It’s taken nearly 20 years of being a photographer/filmmaker but I’ve finally reached a place where I can say I’ve got the packing part dialed. Especially when you factor in carrying 20-30lbs of camera gear, often coupled with climbing/backpacking equipment. It seems most folks I know flat out epic when packing for a 10-day trip (sorry Mom) – but at times I add in: tent, sleeping bag, climbing ropes, climbing gear, hiking boots, a stove, sleeping pad, climbing shoes, cameras, lighting, a tripod, a monopod, assorted cephalopods, raingear, chargers, cables, voltage converters, computer, hard drives, and portable nutrition. Not to mention the occasional 9-foot tube I use to transport backdrops. Remember that list the next time you see someone freaking out about not being able to carry on their half-empty tube of Crest. It’s true: packing is a skill set honed delicately after years of trying to understand the methodologies of airport security. Some mysteries, however, will persist through time. Like did you know a jar containing peanut butter is forbidden, but the same quantity of peanut butter between two slices of bread is not? Spending some time with the Borealis in canyon country. Then there are the international quandaries, like trying to convince armed Chinese border guards to not x-ray my print film. Needless to say I lost that one. Or arguing in Bora Bora that I can fly with my underwater strobe capacitors – I won that one, but only after wrangling a voltage meter-wielding technician. Or the time I was politely escorted by guards holding M16s through an airport terminal, out an emergency exit, and under the belly of Kenya Airways 747 to identify what the mysterious black cartridges with coiled wire were in my luggage (heavy-duty Metz flash batteries). Given that they scared the sh*t out of me, but I was still able to fly with gear intact – let’s call that one a draw. Anyone who has read my blog entries should be well aware of the love affair I have with my Mountainsmith Parallax camera pack, and how essential it is to my travel. But when the brand wanted me to try out the Borealis for a change I felt like I was cheating on a beloved wife who had never done me wrong. I submitted, but dubiously, and committed to a few months of testing. I decided to give the pack a burn for 4 trips: a week in Iceland, a short hop to Colorado, a corporate shoot in Indianapolis, and a climbing trip to Moab. First off, for me to sign off on a camera bag (which more often than not outlast my camera systems) I need some major boxes ticked. Is it able to safely transport my gear? Comfortable enough for heavy carries? Functional on shoots? Most importantly – could it fit all I needed, especially when I was used to a larger pack? The Borealis is slightly more compact than the Parallax, and wears like a champ. Ample padding on straps were quite comfortable on long hikes through the Icelandic backcountry or the thin air trails outside of Aspen. And just like its big brother the Parallax, the Borealis sports a solid front strap system: waist belt with stash pockets (a must for lens cloths and the like) and adjustable sternum strap for folks like me who favor pull-ups over bench pressing. Cinch straps for the back pull it in close for long hikes and blistering sprints through airports, keeping the load close and stable. During both my back was kept dry thanks to the proprietary anvil airway breathable back system. Sharp and comfortable. 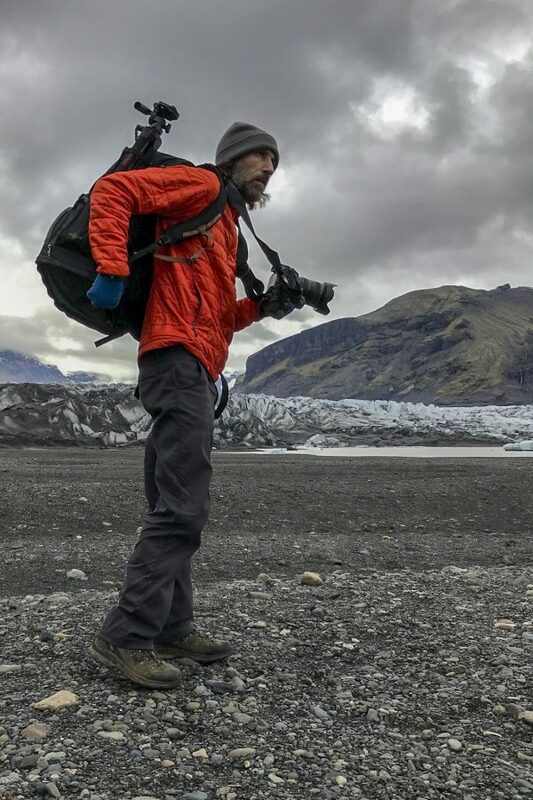 On assignment in the Icelandic interior. 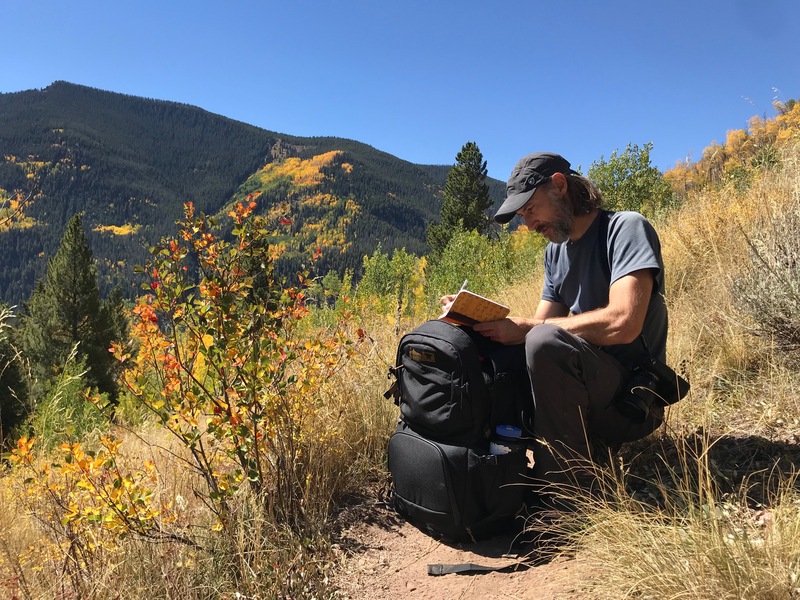 Looking at the bag comfort a no-brainer – Mountainsmith engineers their bags with a bloodline born from outdoor tributaries. Comfort was a check – but could it handle the payload? Cargo was initially a concern for me, as I’m used to a bag which allows me to take a fleet of camera gear. The Borealis divides its payload between a camera compartment and a larger open space taking up the top half of the bag – noticeably smaller than the Parallax in its unique design. I was committed to the Borealis though, and determined to see if it could handle a professional short-term gig. In the camera compartment I had: 1 camera body (with vertical grip), tele zoom lens (100-400mm), wide angle (16-35) and medium (24-70) lenses, plus a flash and remote trigger system. A generous (up to 19”) laptop pocket fit my computer, along with my dog-eared copy of Desert Solitaire. The side pocket easily fit my 17″ laptop with room to spare. The big change was the top compartment, essentially half of the bag’s capacity. No dividers, just open space. Which turned out to be perfect for my chargers, a few changes of clothes, and a hidden tube of Crest that TSA didn’t stand a chance to uncover. Turns out the flexibility of the larger compartment came in handy, and I wasn’t left reshuffling honeycomb dividers to make room for my puffy jacket. But organization freaks like myself can still be satisfied by the many pockets and zip compartments within the pockets – functional and feeding the OCD in all of us. It was easy to cinch my monopod in one side pocket, while keeping the other free for my water bottle and coffee mug. Both of these essential items fit in one pocket, a huge plus. With enough room for a standard camera system and an overnight kit (clothes, charger, few bars, book, toiletries) it seems the perfect companion for a short shoot. 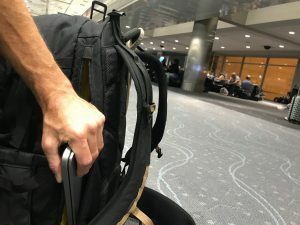 One last note under payload – the bag carries easy through airports, and I was able to cinch it down to fit in an Embraer jet overhead – which is smaller than the usual overhead compartments on commercial planes. Huge plus – with longish legs I’m not a fan of cramming my carry-on bag under 23C and his seat cushion full of beer farts. 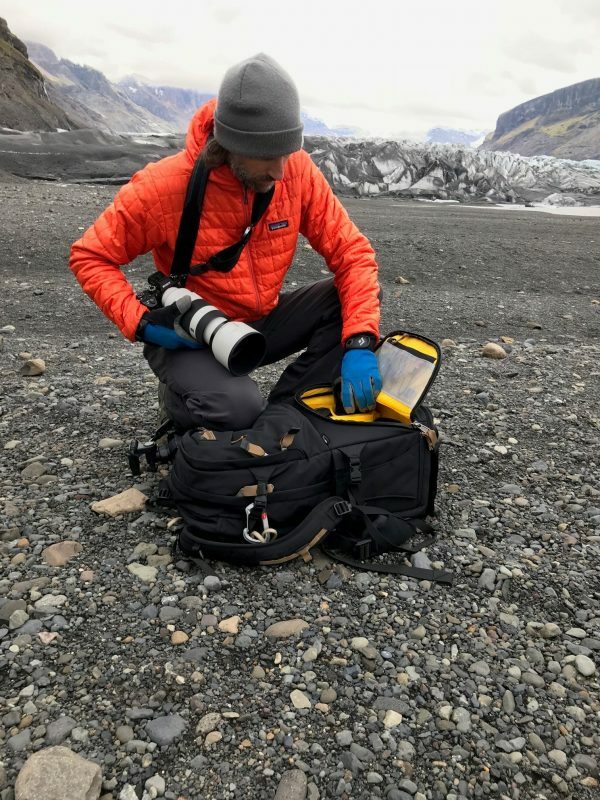 While heading in for longer days in Iceland I ditched the flash unit to stow away an extra lens (24-105), and used the top compartment for rain gear (for me and the camera), an additional long lens (70-200) and second camera body. And I still had enough room for the overpriced Icelandic powerbars. The subdued black-on-black design gives the bag a sharp and professional look, plenty acceptable at a Fortune 500 client’s corporate headquarters. And the interior yellow, while not only being on brand for Mountainsmith, helps keep the usually-black camera bits and bobs easy to sight in moments of quick change. Think lens and body caps, usb charging cables, memory cards and the like. Speaking of which, Mountainsmith keeps their interior pockets large and clear for memory cards, and uses their red/green separating system. I tend to keep my filters and loose cables in these pockets as well. Yellow interior makes it easy to find black camera bits, especially in the dark. Outer zip pockets are great for headphones and bars – and any other stuff I need to access quickly. The hip belt stash pocket is great for a lens cloth, a few extra storage cards and my personal business cards. Taking notes with the Borealis while doing some trail shooting in the rarefied Colorado air. Changing gear while shooting was pretty easy as well – the front-loading compartment lets you get to the whole gear compartment in one zip, and the honeycomb storage kept things easily organized. All Mountainsmith gear has a bomber legacy, and my gorilla testing confirmed the Borealis is up to the usual standards. I crammed it in overhead compartment, dropped it on hard floors, shoved it under tons of climbing gear, bounced it around the trail, and dragged it along a glacier. Not so much as a slipped stitch, torn fabric, or blown zipper. Speaking of which, the camera compartment has a waterproof zipper – nice touch to back up the built-in rainfly. As for the security of the camera compartment itself, well – I’ve got a moment of blunt honesty here. While on the corporate shoot I changed lenses quickly, and then shouldered the pack. Being so used to the Parallax and its rear-loading system, I forgot to zip closed the front of the camera compartment. Friends, that’s worse than forgetting to hook up the doll. In a moment that defied physics, I carried the bag and didn’t lose a single piece of gear with the zipper open – thankfully the Borealis has failsafe geometry in case of emergency. Or in my case in case of case incompetence. 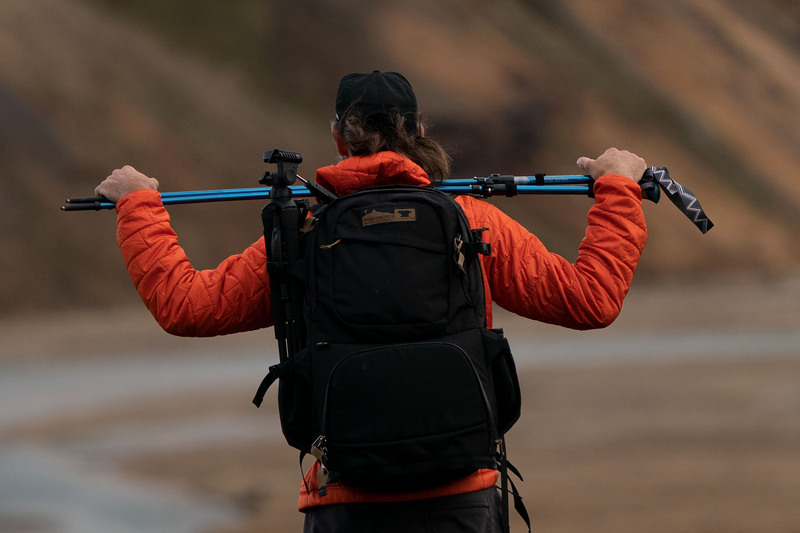 Bottom line, the Borealis is a flexible bag perfect for a do-it-all kit while traveling. The top compartment initially put me off as wasted space, but instead of lamenting lost camera storage I found myself digging the fact I could pack clothing etc. into the bag, making it a perfect overnighter. A comfortable carry and functional in both the front- and back-country – it’s earned a spot in my arsenal. Just give me some time to break it to the Parallax.